‘Buchheim’ is a German word for a book city. In Europe, there have been small book cities from hundred years ago. There could be Book cities in Korea. However, as far as we know, fast growth of Korean economy in last half century removes all the trace of old book cities. We would like to regenerate a book city in Daegu, Korea. – the dreaming Buchheim, where is different from typical public library. Circulation starts at woods, where is connected to the site on north direction. 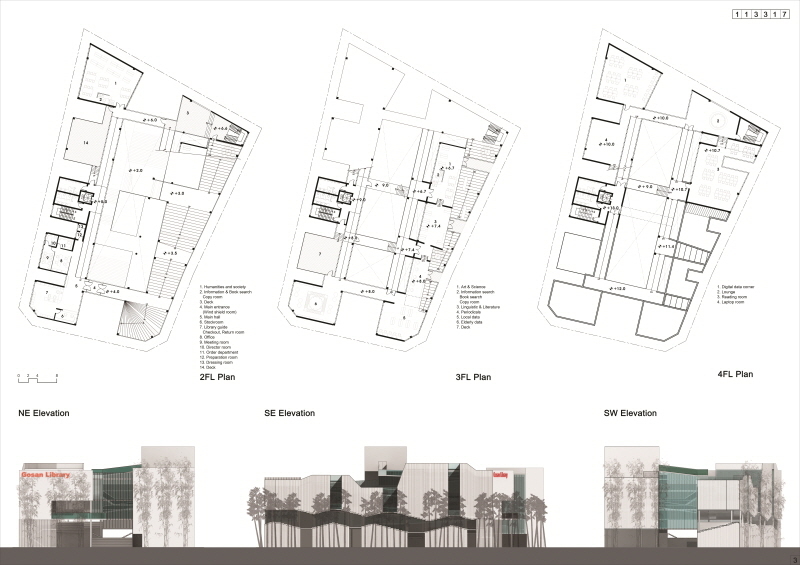 ground level consists of local community facilities such as culture classroom and children’s library. Walking on the grand stairs on the middle of the site, visitors have two choices on the mezzanine level. One is going to children’s library and the other is going to series of grand stairs, which are up and down continuously. This place, which is called ‘Epistemic Mountain’, is where visitors can sit down and read books or talk with friends. At the end of epistemic mountain, there is a entrance bridge to main library. visitors experience various in & outside spaces. On the 3rd floor, ramp spreads out to diverse subject reading rooms. On the side of each reading rooms, there are indoor steps for reading and outside decks. Spaces for digital multimedia locate on the 4th floor.